recently, as mentioned in my june favourites post, i’ve been drawn to orange and red tones so they’ve been taking pride of place in my collection. my favourite ‘drug store’ (as we’re all american now, apparently) range will always be topshop, as it really is great quality so topshop oh la la is always one of my first picks. it’s about a pale a coral as i would go but has a lovely finish and last so well. another from their line would be topshop sartorial, which is my all time favourite coral, but i talk about it a lot so thought i’d leave it out this time. going a shade darker is illamasqua scandal that i picked up in their sale. it’s matte yet non drying and gives a great pop of colour to the lips. leaning more on the red toned side of orange is MAC lady danger, which i wanted for years but only recently acquired. it’s such a wearable shade, despite being so bright, and lasts all day. now, if i’m feeling slightly more girly i will stray over to the pink side of my muji storage. 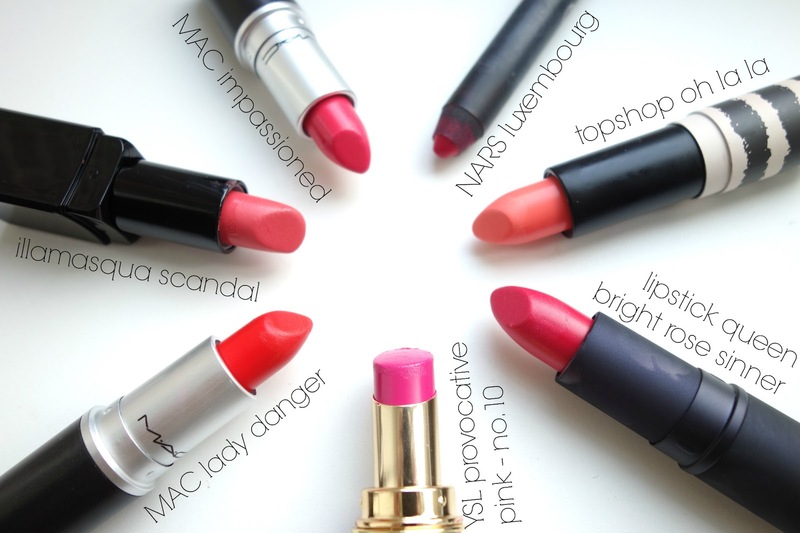 MAC impassioned is a great bright, not quite neon, blue-based pink which looks lovely on so many skintones. another flattering shade is YSL rouge volupte in no.10 provocative pink, which is the perfect bubblegum tone that is so creamy when applied and feels very luxurious (and so it should for £24.50!). as i’ve been getting more into brands that are stocked in space nk, it’s no surprise that NARS have came well into my radar. 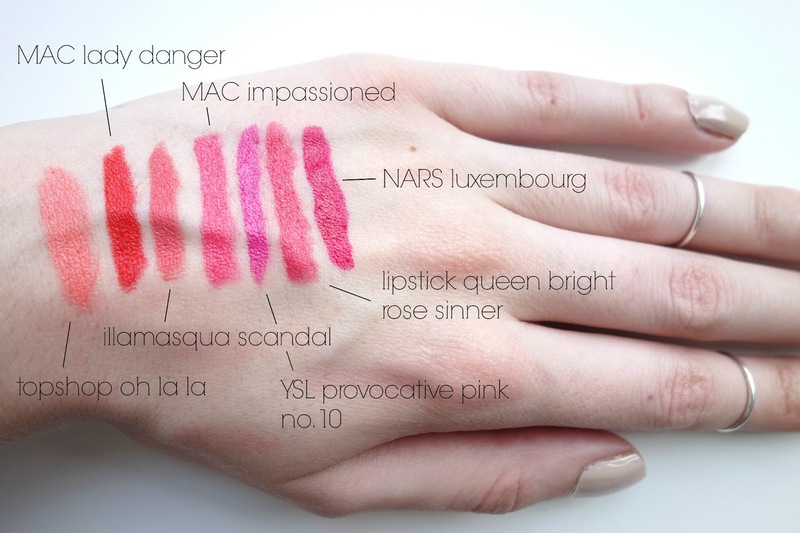 this NARS satin lip pencil in luxembourg is the most amazing hot pink that’s much more vibrant than the swatch makes out. it’s my go to pink, as it’s so easy to apply and sits nicely on the lips. another space nk favourites comes in the form of lipstick queen bright rose sinner, which is a beautiful bright pinky/watermelon shade. i have two more of the ‘rose’ shades from the sinner collection and i love their matte finish, as it has great lasting power. 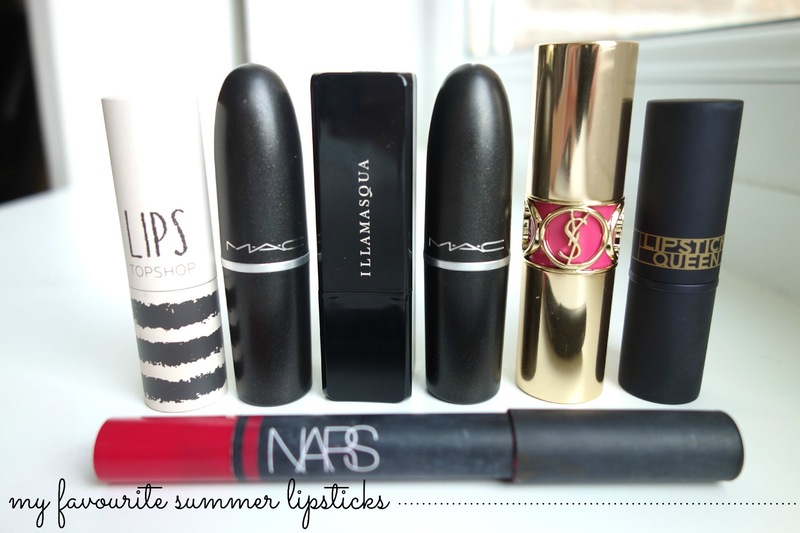 so that’s the main lipsticks i’ve been reaching for as the weather has got slightly warmer. i know a lot of people go for sheer, more glossy finishes in summer, but i stick to long lasting smudge proof lipsticks, as i find them less effort to wear as you don’t need to touch them up as much! what are you favourite summer shades? any you think i’ve missed off the list? ps. check out these blogs: caribbean flower, velvet daisy and jessica’s journal!